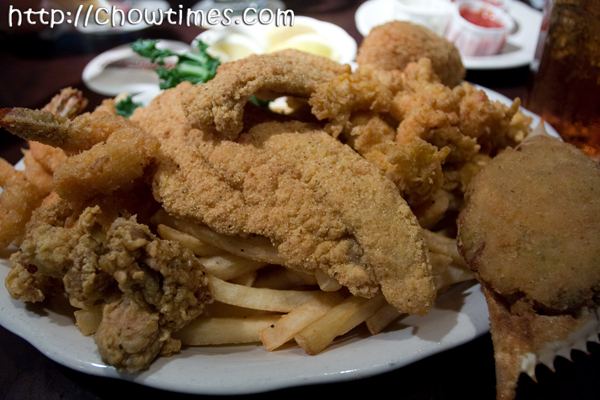 The people in the Atlanta office recommended we try the Crispy Fried ALLIGATOR! 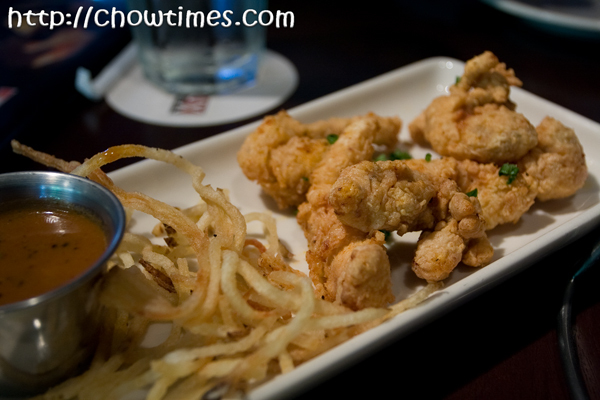 It came with crispy potato sticks and Creole Dipping Sauce. Know what it tastes like? Well, to me, it looks like fried chicken, tastes like fried chicken and if no one told me, I would have thought it was fried chicken. It was unique, that’s all. $10.95 for a large serving. The Mussels Gratin was much much better. 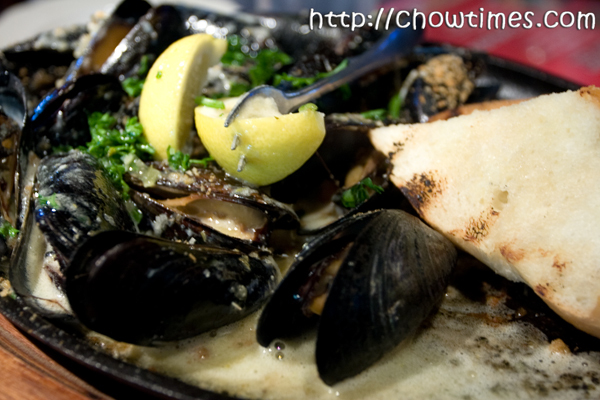 It is described on the menu as “Jumbo PEI Mussels baked on the half shell with Garlic Butter and Fresh Breadcrumbs with Grilled French Bread”. Jumbo PEI Mussels? What is that? PEI as in Prince Edward Island? Whatever it is I love this. $9.95 … and I had most of it. For the mains, I had the tendency to choose the dish with the most’est. I would choose the dish with everything in it … so it would have to be items with the words “platter” or “combination” or something to that effect in the name. 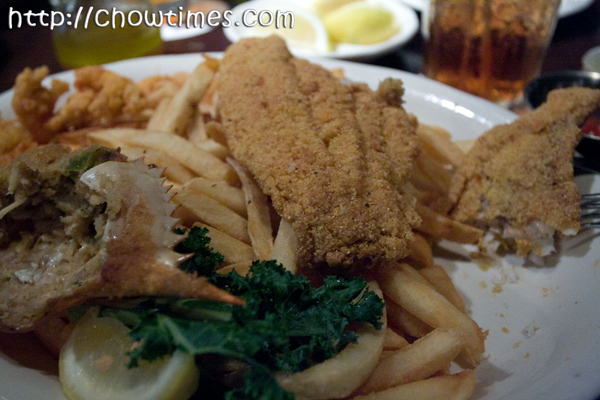 Since this is a “seafood kitchen”, I ordered the Pappadeaux Platter which incidentally is the most expensive item on their seafood section of the menu ($24.95). 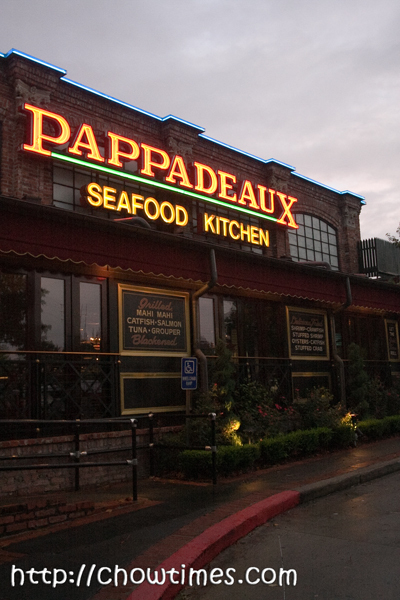 The Pappadeaux Platter is the mother of their seafood items. 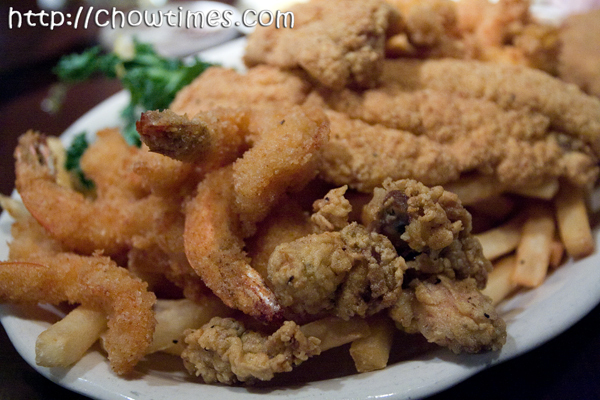 It has Fried Shrimp, Fried Oysters, Fried Catfish Fillet, Fried Crawfish, Stuffed Shrimp and Stuffed Crab. Was it good? Urgh! It was too dry … too much fried stuff. Some of the items were good but as a whole it was too dry for me. I ended up leaving it half finished … see above. But dessert was awesome. 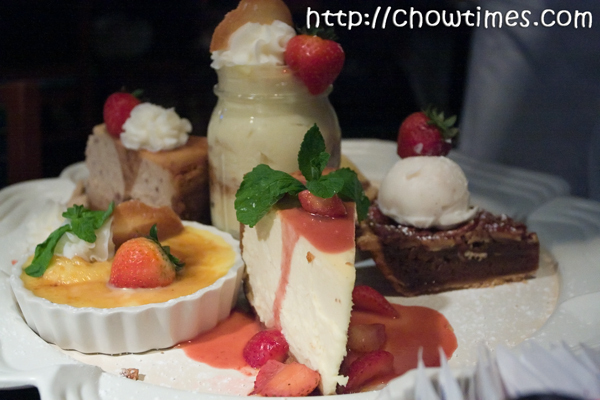 They came by the table with samples of their dessert … real samples arranged nicely in a platter. I like the way they presented it. Instead of giving us a dessert menu, they brought everything they have to our table to choose. How could one resist this right? I told the waiter I want the TALLEST item. I don’t even know what it is called but I vaguely recall it was some bread pudding of sorts. I only remembered I enjoyed this one. Ryan and Mick were talking work the whole night but me, I was only thinking about the food. It was a good dinner for me especially just having got off the long flight. I felt very relaxed this time because this is the only time in Atlanta where I had only one single mission … just to attend a 2 hour meeting and I don’t even have to prep for it. 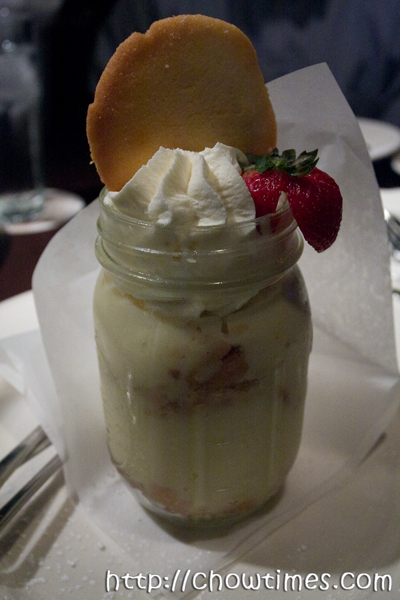 The dessert you had was Banana Pudding. Just reading your blog made me hungry! They look so good. I am so hungry. 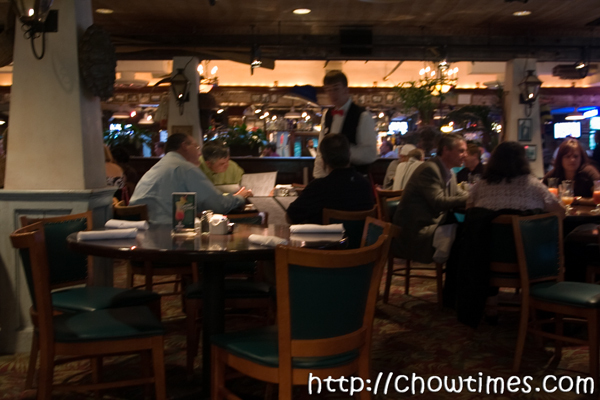 Love the blog – I’ve been to Papadeux one time and the wait staff are under a lot of pressure. Evidently they can get fired after 1 or 2 customer complaints. 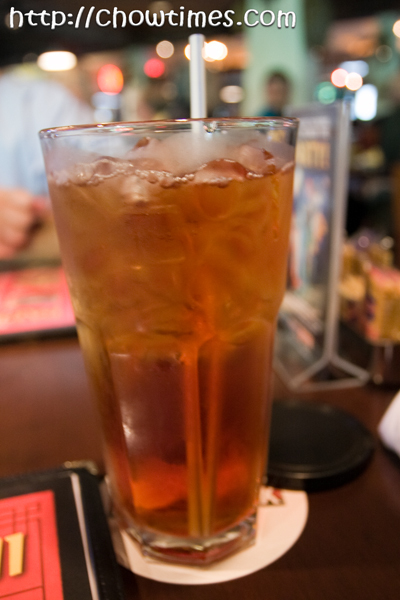 When I went, the waiter for our table was this older guy who used to be in graphic design and got laid off. This other table he was waiting on was very rude and were complaining that they weren’t getting their food fast enough. We made a point to tell his manager that he was doing a good job.